The first batch of Robocoin ATMs destined for the Far East is expected to land in Taiwan and Hong Kong later this month. The company is planning to expand its presence in Europe and North America, but for now, eight new units are receiving final touches and they should ship to Asia sometime in January. The company noted that it is heading to “bitcoin-hungry” markets in Asia, namely Taiwan and Hong Kong. It is not clear whether mainland China will get any bitcoin ATMs soon, given its clampdown on bitcoin operators last month. The ATMs destined for the Asian market will feature a new user interface in simplified and traditional Chinese, but other than that they appear to be standard Robocoin units. Kelley also highlighted Robocoin’s commitment to complying with local regulation and delivering consumer protection software. The ATMs combine biometric authentication, government issued ID scanning as well as verified facial matching, which makes them somewhat more secure than traditional ATMs we use every day. Robocoin says it has sold dozens of units so far and global distribution is slated for January. Things should pick up in March, when the company plans to ship 39 units worldwide. Other international locations include Europe, Canada, the US and other Asian countries, although the company has not disclosed the exact locations. However, in a recent interview with Tech Crunch, Robocoin’s Sam Glaser hinted at Manhattan as one of the next locations. Of course, Robocoin is not the only company vying for the lead in the bitcoin ATM market. Last week Lamassu announced the sale of its 100th bitcoin ATM and it claims to have received more than 120 orders since it started accepting pre-orders in August. 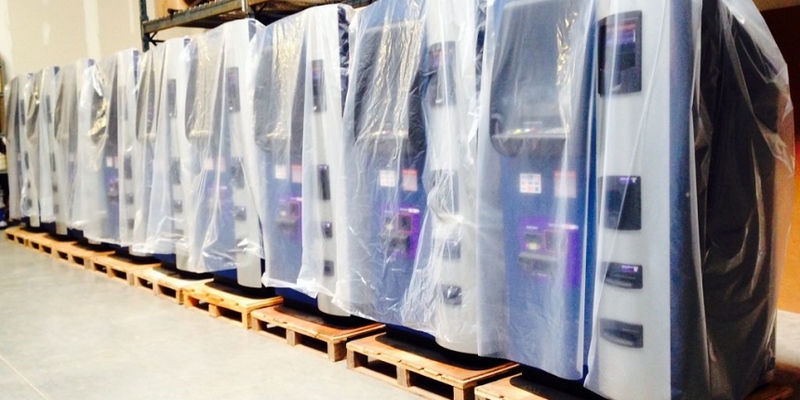 More than a dozen Lamassu ATMs have been delivered so far.